Well, the last post from the old MySpace blog went live here on WordPress earlier this morning. I guess that’s that. It’s been such a part of the Sunday morning routine for me that it feels a little strange now that it’s finished. Don’t get me wrong, though, I am extraordinarily happy to finally have the “collected works” all under one roof for the first time. I like knowing that if I get hit by a bus on the way to the office tomorrow, at least this one small bit of me will endure in electronic form for as long as there is an internet. Let’s not get into too deep a discussion that this is what I’ve chosen to leave as my eternal legacy to the world. Sure, it’s no cure for cancer, but as an historian, there’s nothing we like more than day to day commentary about how things were in the olden days… so, blogging is a public service (for a public that hasn’t been born yet). I don’t have any really solid idea about how the statistics add up but a quick guesstimate would be that I’ve posted something in excess of 300,000 words and garnered something like 60,000 visitors between MySpace, Blogger, and finally here at WordPress. 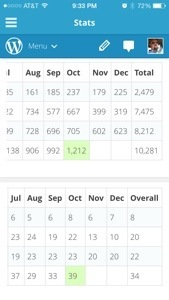 Those visitors have had the chance to read 1,518 individual posts between June 2006 and December 2013. Yep, if you’re doing the math at home, that’s seven and a half years of blogging, and I feel like I’m really just starting to hit my stride. If you’d like to stop by the archive for one last look around and to see the last four posts from the days of MySpace, here’s the inevitable link to October 2008. The transition from MySpace to Blogger was relatively seamless, so you’ll have to scroll down a bit to start on October 19th. Be sure to check back next week to see what the “new” Sunday mornings look like. Most monthly views. Highest average daily views. Best single day number of views in the history of the site. Thank you October. Thank you readers. Thank you WordPress! Let me say that it’s a big week for me personally and that as a result I’m about to geek out on you guys a little bit. Today marks the 3rd birthday of jeffreytharp.com and running this blog as an independent website. After spending my formative years blogging on MySpace a short stint on Blogger, I’ve thoroughly enjoyed having a permanent place to hang my virtual hat. Having the name right there as the web address means you’d damn well better be willing to be accountable for whatever comes flying out of your mouth. Even though it’s occasionally caused some friction, it’s made be a better blogger and a better writer in general. It’s absolutely worth it. 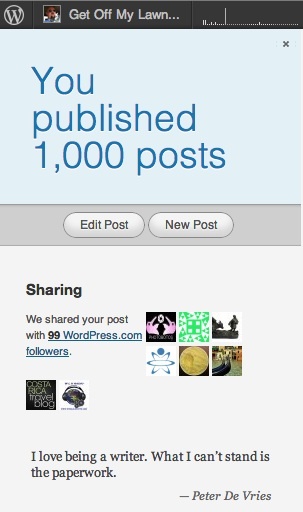 In addition to marking a birthday, this week also saw my 1000th post go live. Since there is still more good stuff coming from the archives every Sunday, I look for that total to keep going by leaps and bounds. All my old blog posts from MySpace are now available here and I’m working my way through the Blogger years every Sunday. I’m really looking forward to finally having all my posts under one electronic roof sometime in the next four or five months. Finally, thanks to everyone for keeping up with me from June 29, 2006 to today. I know the “about” section claims that I don’t write for an audience, but we all know differently. No one throws this much life and opinion into the ether if they don’t secretly enjoy being the center of attention from time to time. I supposed that’s not really much of a secret anyway. 19,526 visits, 1,003 posts, 314 comments, and 59 countries over the last 1,095 days. For one sane voice in the wilderness, that’s a pretty respectable record. A New York City subway train holds 1,200 people. This blog was viewed about 7,300 times in 2011. If it were a NYC subway train, it would take about 6 trips to carry that many people. Some time around 10:00 PM CDT yesterday, the total number of views for 2011 climbed past 2479. There’s nothing particularly special about that number other than the fact that it is also the total number of views Get Off My Lawn had in all of 2010. With the fifth month of 2011 barely halfway through, I’m very pleased with what has the potential to be a doubling of views year-over-year. Of course that largely depends on my continuing to write and your continuing to have at least a passing interest in whatever happens to be on my mind when I sit down at the keyboard. I know that little “about” tab at the top of the page says “I’m not writing for an audience,” but if we can level with one another, no one puts something on the internet without at least hoping for an audience. If the metrics are any sign, it seems that I’ve found my niche. Fortunately, snark is a strong suit for me. In fairness, this is more a post in tribute to you readers who check in every night or a few times a week who keep those numbers up. Now that we have the worst of this job search fiasco behind us, I hope you’ll be entertained with the growing saga of how to find a house to rent when you have two larget but harmless dogs, the pain and agony of dragging a couple of thousand pounds of personal effects halfway across the country, and starting yet another job for which I have no actual education. It should also be interesting to lean if I still remember how to live on the east coast, fight may way along I-95 twice a day, and kick the pace of life up a couple of dozen notches. Trying to figure out how to pick up life where I left off five years ago should prove hours of entertainment for all of us. With the move date closing in, I won’t promise to keep up the every night posting schedule, but what does make it to the screen will have a story worth telling.